We also have two new friends in our home,who in this picture seem to really be in love as well. I got the pattern from a book I found at an estate/tag sale this summer. It was a little lady who was moving from her home into a nursing home and selling many of her posessions. She was so crafty and the sale was full of patterns, yarn, thread, books, needles. Tucked inside this book was a little notecard with her shaky handwriting that listed all of her grandchildren’s names. Beside each name was the toy she had picked out from the book to make for each of them. Very sweet. The turtles are filled with lentils which makes them so floppy and fun. The girls love tossing them around to each other and Emma carries hers around in a big green bucket. Your pancakes looks so much better than mine. 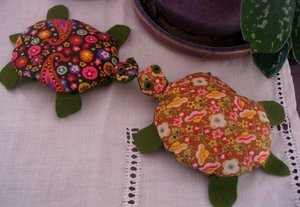 Those cute turtles, you’ve been holding out, I love the fabrics you used. Things with lentils are so fun to toss around. I LOVE the turtles!! They are wonderful!Happy Valentines day! do I need meds if my eyes welled up at the image of that shaky list of gifts for the grandchildren? that IS sweet. what a treasure; everything you make from that book will be an extension of that gesture. neat. sorry your husband is away, but your day sounds lovely, and the turtles are so cute! I agree with Steph, the thought of that little lady selling her possesions to go to a nursing home make me sad. It is so nice that you are putting the book to such good use. The turtles are precious! I make green food for St. Patrick’s day too. 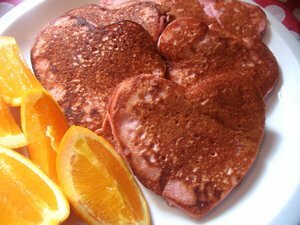 I made those same pancakes for valentine’s breakfast, except without the pink! 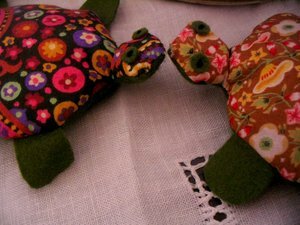 cute turtles too, I love the fact that you are going to carry on the craftiness after this lady. I didn’t attemps heart pancakes, as I was afraid that they wouldn’t look too heart-shaped, so I went with heart french toast. I wish I had taken a picture! LOVE the turtles! My four-year old has a thing for turtles and those are especially adorable! and how sweet is that about thegrandchildrens names and what she plannedto make them…awwwww. Cute pancakes & turtles.I had to laugh at the green breakfast. I have done that myself. We even read Green eggs and ham. And for supper I add a drop of green to the scrambled eggs.One day we were being silly and made a blue supper. Blue mashed potatos and milk were a couple of the things. Kids Love it. I’m sure all that dye was probably horrible for you, but it’s not very often I go to that extreme. Those turtles are so cute. Your pancakes look awesome, I free handed some heart pancakes, they didn’t look nearly as nice as yours, they were more on the abstract side. I love the pink color. Oh wow, love those turtles!! It’s funny that you made some, I’ve been thinking about turtles recently. We love turtles over hear, turtles and frogs 🙂 So much personality those guys. The fabrics are excellent choices too! These turtles remind me of a crocheted one I had when I was small. Just seeing these makes me want to dig it and and then learn crochet! Thanks for reminding me! 🙂 Hope you had a lovely Valentines.